The water is dark and muddy. The monsoon rains pour into the river making currents swift, treacherous and strong, grabbing all things, eating away the banks, uprooting plants and sweeping them into the South China Sea. Sand bars shift and change daily like mischievous children playing tag with the boats. Sharks feed near the mouth. Water snakes are seen everywhere. The Cua Viet River provides food and transportation from dawn until dusk. It is strategic. It is a natural barrier and a vital conduit for supplies. At the mouth, on the south bank, is a lonely bleak and sandy place. 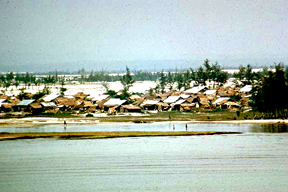 A group of colorless shanties placed at odd angles and apart from each other dot the land. The shacks are bound together by wooden pallets laid end to end forming walkways but leading nowhere. Sandbags are piled high around each hooch. The boundary to the north is the river and to the east is the sea. Concertina wire, tangle foot, and mine fields bound the south and west. A concrete ramp slopes gently into the river. Men scurry, moving cargo between LSTs, YFUs and LCUs bound south for Da Nang or west to Dong Ha. East of the ramp are some ammi barges. Alongside are moored landing craft wallowing up and down with the barges as the surf rolls into the river. Farther west is a beached barge that shelters the PBRs of River Division 543. The sleek modern patrol boats bristle with weapons. The last pier is the home of 6 steel Mark 5 LCPLs, 1 fiberglass Mark 12 LCPL, and a wooden 45-ft. Picket boat belonging to the Dong-Ha River Security Group. The Mark 5s are very old and beat up. They are dented and patched veterans of 3 wars. The Mark 12 is new. The Picket boat looks neglected and tired. Inside the perimeter only a few feet west of the head of the pier, about 10 yards from the water, stands a 50-ft. observation tower. 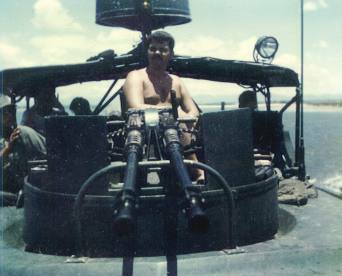 The sentry stares through a binocular 10 miles to the north at another tower where a North Vietnamese sentry stares back. The lapping water, the groan of mooring lines, the crashing surf, the haunting whisper of the cold sea breeze are the only sounds. Dark lowering clouds place a weight upon the scene. The light is sickly and pale. What is not mildewed or rusted glistens in the never ending rain. A sandbag hill nearest the PBRs is a small clinic. Three Navy Corpsmen treat the sick or wounded. To the south in a half buried Quonset hut covered with sandbags is Stingray Control command post from which radio antennas reach up striving to touch the clouds. East and three huts down is a black sign with a flying bat outlined against a full orange moon nailed to the door of a hooch. Underneath the moon are the words, Dong-Ha River Security Group Night Fighters. A little farther east, on the opposite side is a sign announcing Headquarters River Division 543. 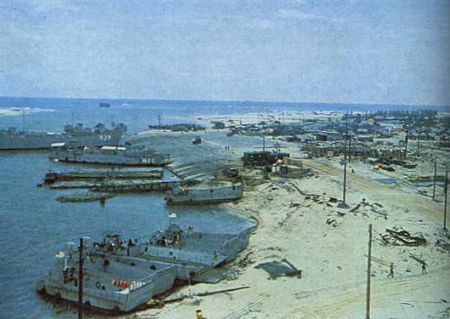 Cua Viet is the name most often used to describe the Naval Support Activity Detachment immediately adjacent on the western border of the US Marine Amtrac base called Camp Kistler. It is 3 1/2 miles south of the southern boundary of the DMZ. 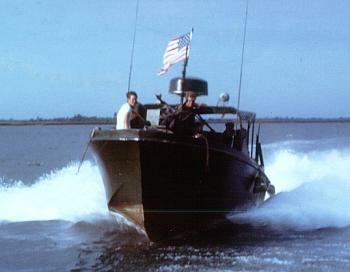 The mission of the Amtracs and patrol boats is to deny enemy access to the river and protect the flow of supplies to Dong-Ha. 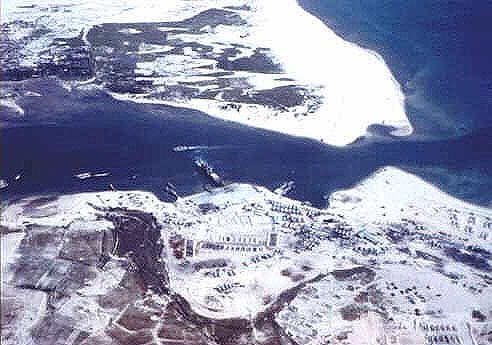 On the north bank is a Marine rest and recuperation (R&R) camp. Tents mark the position in a corner formed by the sea to the east and the river to the south. West is a small fishing village called My-Loc. The village is protected by Popular Forces. The PF are poorly trained civilian militia. Half a mile west is the rubble of a city of old French colonial buildings. From the ruins rise columns attesting the architecture of a forgotten time. No one knows when it was built, no one knows when it was destroyed, and no one cares. The history has been lost in the misery and turmoil of over 50 years of war. Directly across the river is an old colonial home on the branch of a south loop that goes around an island in the river. This is the headquarters of a detachment of Coastal Group 11. The force consists of American naval advisors, men of the South Vietnamese Navy, and seven junks with eyes painted on the bows. Most of the sailors have tattooed the words Sat Cong across their chests. It means, kill communists. These men patrol the seacoast from the DMZ south. A creek runs north a mile west on the opposite bank. It is so small that it doesnt appear on maps. The mouth is strung with row after row of concertina wire denying access to or from the river. It is called Whiskey Two. Jones Creek opens to the west. It was named for the first American casualty in the vicinity. The creek is narrow and treacherous but navigable. It is a natural and convenient infiltration route for the North Vietnamese Army (NVA). Because the creek is narrow, ambush is deadly. About 200 meters north on the east bank is a US Marine outpost. The Dong-Ha River Security Group patrols 5 areas code named One Lima through Five Lima. An LCPL River Patrol Boat is assigned nightly to each. The PBRs of RivDiv 543 furnish 4 boats nightly, two on the lower river covering One and Two Lima, and two on the upper river covering Three through Five Lima. A Patrol Officer is assigned to the upper and lower river. One Lima begins at the river mouth and ends at Whisky One, a large sandbar that forces the boats to make a diagonal tack from south to north when proceeding up river. It has proven to be the safest area to patrol. Two Lima begins at Whiskey One and ends at the New Channel. Most of the successful minings of the river have occurred in this area. The mouth of Jones Creek is at the western boundary. 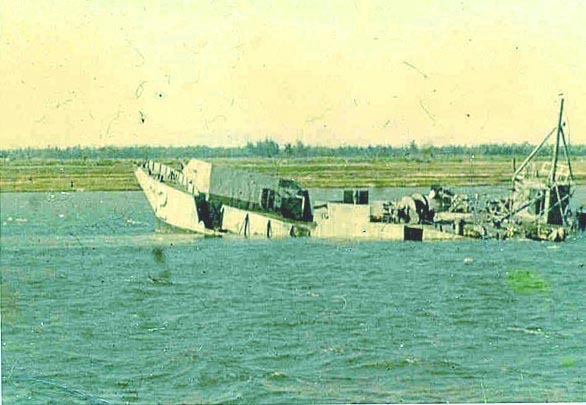 A mine in the Two Lima patrol area sank YFU-62. It's back was broken by the explosion in January 1969. Crewmen killed in the blast were: EN2 Francis D. Campbell, Gearhart, OR; EM2 Wendell A. Morrison, Springfield, MA; SM2 David L. Holdredge, Los Angeles, CA; CS2 Kenneth M. Russell, Judsonia, AR; RMSN Milton J. Worrell, Donalsonville, GA; NFN Erik N. Rudziak, Carlisle, PA; FN Alfred Bauer, Keansburg, NJ; and FN Edward E. Stockewell, Jr., Metairie, LA. The New Channel is a shortcut splitting a large island into two. Both are covered with mounds, graves. The water table is so high that the dead are placed upon the ground then the earth is heaped over the bodies creating mounds. Some have monuments of stone. Some are obviously French. It is a haunted place where strange things are believed to happen. Three Lima runs to Whisky One Three a passage around a sandbar near the south bank, across from which is the northwest tip of the northern island created by the New Channel. A tributary of the river runs behind this island connecting with Jones Creek. Four Lima ends at Whisky Nine where the river narrows. It is a favorite fording spot for the NVA infiltrating south. The north bank is covered with large rocks a tree line and thick vegetation. Many battles were fought in this vicinity. Five Lima runs from to the Bridge at Dong-Ha. It is the narrowest of all the patrol areas making it a natural place for sappers to mine the river. Every successful attempt at mining occurred in Two and Five Lima patrol areas. Two other areas are patrolled infrequently. The first is Jones Creek. The other is the branch running from Whiskey Nine to Quang Tri City. During the dry summer months it is barely or not navigable at all. Both are extremely dangerous. Me, the tallest, taking my LCPL Mk-12 up River for the nights patrol. At the southwest bank across from Whiskey Nine there is a small boat city nestled into the protection of the elbow of a sandbar. These people are born, live, and die on their sampans. Some never stand on solid ground in their lifetime. I remember every detail every bush every rock and every tree. I remember every moment of every single night. I don't remember much about the days. I am at the helm. The sun is sinking behind the mountains. I throttle back and disengage the screw to drift. Silence, broken only by the soft patter of rain. We are so used to the low rumble of the engine that we don't hear it. The sampans have vanished. The paddies are empty. The water buffalo have been trundled off to wherever they are taken for the night. It feels like we are the only ones left in the world. The light fades... ever so slowly, until complete darkness settles upon the river. We are blind. The rain continues to fall. Everything is eternally wet. Everything is musty or mildewed. Everything stinks. In the distance red and green tracers light up the sky. Hundreds of explosions imprint upon the mind as B-52s let go their lethal load. It is a million 4th of Julys. The night passes infinitely slow. It's as if there will be no light no warmth no security, and nothing dry upon the earth. We strain to see in the black void that envelops us. We listen intently for a warning that might save our lives. The distant sounds and flashes of battle are everywhere. Occasionally the light of an explosion is bright enough to just make out the face of a crewmember frozen for just the fraction of an instant. The image is gone so fast that it is impossible to tell if it was real or a figment of the overwhelming desire to see something... anything. Suddenly, without warning, we are ambushed. Streaks of light cut the night. The whoosh of rockets is deafening. I hit the throttle, turn the wheel hard over to bring weapons to bear, and bark orders at my men who have already commenced firing. With only yards between us a fierce exchange takes place. Red or green points of light appear in the distance very small at first but growing larger, slowly picking up speed, accelerating beyond expectations, growing exponentially in size until disappearing behind me. I can hear them like angry bees whizzing past my ears, but they are not bees. In-between each tracer are 5 more bullets that cannot be seen. Suddenly enemy action ceases. Fire continues into the area until my gunners begin to hear my shouts, "Cease Fire," and release their triggers. Soon the last echoes of our guns fade in the distance. Barrels glow red in the dark. The last ricochets fly away until they disappear into the night. Shell cases roll clanking across the deck as the boat rocks in the turmoil it has itself created as a result of my evasive maneuvers. The after 50 cooks off a round and the boat begins a very slow spin from the recoil. A miracle... not one of us has been hit. I am occupied on the radio in coordination with Stingray Control alternately shouting across the water to the boats that have come to our aid. I ask for an artillery strike but all of the firebases are busy providing artillery for other units that are also in contact. We point out the location of the ambush to the other boats then recon by fire, peppering the tree line with bullets that ricochet up and at odd angles. Some streak into the clouds. There is no return fire. Boats nest together for consultation between captains. After a time we resume patrol. What seems like ages later I begin to make out shapes against the night. It is twilight. The sun begins its creep over the horizon and a fog settles down upon the river. I tip the barrel of the after 50 to the sky, mount Old Glory upon the stern to catch the sunrise, and with a sense of relief order the helmsman to turn the boat into the light. We inventory ammunition trying to calculate the time it will take to clean the guns. The Snipe cracks a joke and laughter wafts across the water. Tension begins to break. The flag snapping and popping in the wind whipped up by the speed of the boat fascinates me. I feel the same pride swell in my breast as when a boy I watched it pass in parade. Suddenly. we emerge from the fog with the sun rising before us. It has just a little way to travel until obscured by the clouds; but for now the light is warm and incredibly beautiful. Promise is what we feel, at least for this morning. I am one with my crew. I am so very proud of them. It feels good... to be alive. And then. everything begins to fade... it's all gone. I wallow in confusion struggling against a terrible loss. I am awake. That was the dream that night. They are not always the same and not always what I remember. Only a few know of the place. It was a very small part of a very large and terrible nightmare, but it was reality. There a hot beer tasted damn good. Lima beans and ham from a can was a gourmet meal and nothing was ever taken for granted. On the Cua Viet River I discovered the terrors of the night and of the mind and conquered them. I developed a sixth sense and the dark became my friend. I fulfilled the trust that was placed in me, gained a confidence I never thought possible, and learned to respect my enemy. I made my peace with God, and forever lost the fear of death. I found the meaning of the morning. Read the comments of visitors to this website.